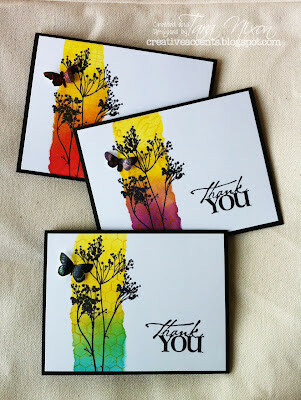 This is a little 4x4” card, with some of the leftover die cut hearts from background paper I inked up. I applied some Abandoned Coral Distress Oxide over one of them to provide more contrast, as well as giving me a nice match with my stenciled background. This “thoughts” design seemed appropriate! 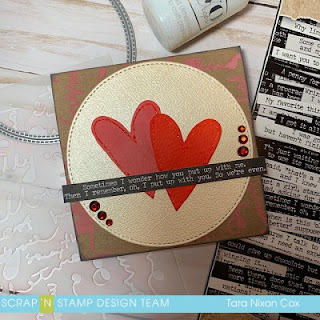 A stitched circle die (by MFT) from pearly card stock gives some nice shimmer beneath the pair of hearts and sticker sentiment. I love these snarky small talk stickers and can’t wait to get the new larger ones when they come out! Some little touches of red bling and some Nuvo glitter outlines finishes off this little cutie. And for the record, my hubby got a chuckle from the card!